The San were a fascinating group of people that inhabited South Africa, even Kagga Kamma, many, many years ago. From their history to their language and beyond is absolutely captivating – so Kagga Kamma put together this concise general guide of the San clan to inspire and inform you. The San people were the earliest hunter-gathers in the southern most reaches of Africa and were found here, thousands of years before Europe scrambled for Africa and long before other “Bantu-speaking” nations arrived. According to Cape Inter Faith Initiative, the San were known by some as “Bushmen”, which originates from the European Colonists term for these tribes. This name is a widely contested term today and most believe it to be derogatory. However, there have been reports of some of the San’s descendants preferring this term because it promotes the idea that they are “tough, strong and resilient”. But San, not “Bushmen” is the widely accepted name for these hunter-gatherer tribes. According to SA History, the San’s intriguing ancient language consists of “implosive” consonants or “clicks” and belongs to a completely different language grouping than that of the “Bantu speakers”. Generally, there are two different, identifiable languages known as, San and Khoikhoi. Many dialects stem from these two, including: Xam, N?Â¡, !Xu, Khwe and Khomani. NÁƒ mÁƒÂ¡, previously named “Hottentot”. Regrettably, there is very little known about the different dialects of the San people – as most of it was never documented. There is however, documentation of the /Xam dialect that was spoken by the San. A German linguist, Dr WHI Bleek, recorded the /Xam dialect almost in its entirety and this has thankfully preserved some of this San dialect. SA History explains that the /Xam speakers originally occupied a great deal of the western parts of South Africa. But by 1850, only around a hundred /Xam speakers lived in remote parts of the Northern Cape. Regrettably, today, the language no longer exists –other than in a 12 thousand page, hand-written account recorded verbatim, from the last /Xam speakers in the 1860s and 1870s. Fortunately, this account includes information beyond the /Xam language – it includes myths, beliefs and rituals, which gives a great insight into the tribes’ dynamics and culture. A comprehensive /Xam dictionary was produced by a Dr Bleek hundreds of years ago; but it was only published years after it was written. Did you know? South Africa’s motto, written on the South African Coat of Arms is actually a /Xam phrase: “!ke e: /xarra //ke”. This literally means “diverse people unite”. Interestingly, the San were democratic in their decision-making and in their governance. They did have chiefs, but authority was limited. Most decisions were made by general consensus and the decision makers included women, who were regarded as equals to the men in the tribe. Although women were mostly involved in foraging for food, some of them did hunt and some men foraged, which shows there weren’t any fixed gender roles in the San tribes. Besides the egalitarian way of governing, the San were very generous and had a culture of giving – preferring to give rather than trade items amongst their clan members. In general, the San lived in harmony, had a rich oral storytelling tradition and used their art to tell significant and symbolic tales of victories and the like. The paintings and engravings done by the San on cave walls and rocks are generally called rock art. Although, the whole of Africa has many rock art sites, South Africa seems to have the most beautiful, detailed and advanced examples. The San used natural ingredients that occurred in their surroundings, to create interesting depictions on cave walls and/or rocks; different shades of red and yellow were most often used in their work. To make the reds or yellow-brown pigments, the San used iron rich clays that were formed from breaking up rocks and grinding it into a powder. Other ingredients included: animal blood, fat and berries (if they were available). White and black paint was also used by the San. The white mainly consisted of animal fat, bones, droppings, white clay and egg shells, whereas the black mainly consisted of charcoal, manganese oxide and animal fat. According to SA History, it is fairly common for one rock art site to have different paintings, done at different times, by different tribes. This is also why some of the sites will have depictions that are clearer than others; because the older paintings may appear more faded than those that were painted long after. Unfortunately, many rock art sites have been damaged due to erosion from natural elements and sometimes – sadly – even by graffiti. Depictions done in white paint also seem to fade more rapidly than the browns, reds and orange colours. The saving grace for most of the existing rock art is the fact that the San mixed the paints with animal fat, which made the paint fairly water- and element-proof. San rock art is known for its details and intricate lines, which offers a lot of particulars in the storytelling process. The reason for this is that the San made their own paintbrushes – feathers, animal fur/hair and porcupine quills were often fashioned into brush-like tools, which allowed plenty of details in their symbolic/spiritual representations. This is also something important to note – rock art had great spiritual significance for the San – important events and victories were recorded, as well as symbolic representations of rites of passage, successful hunts etc. It seems to be fairly common that people believe that the San and the Khoikhoi are the same group of people. 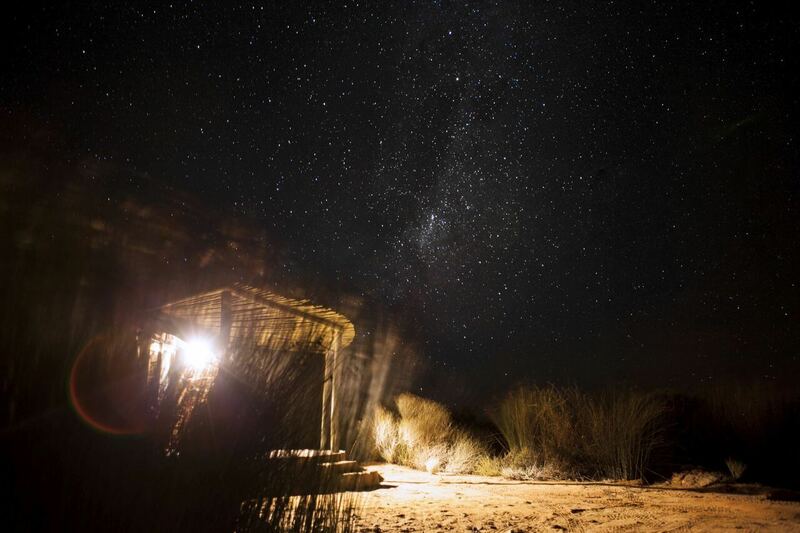 Although both tribes once called Kagga Kamma home, they were not the same people. The word San is derived from the Khoekhoe language and is widely thought to mean “people without cattle” or “people who forage for food”, which is related to the San hunter-gatherer nature. The word “Khoikhoi” is believed to mean “men of men” or “real people”; these tribes were herders and farmers – very different to the San who foraged for food and hunted. Read more about the Khoikhoi tribe in The Khoikhoi Tale: The “Real People.